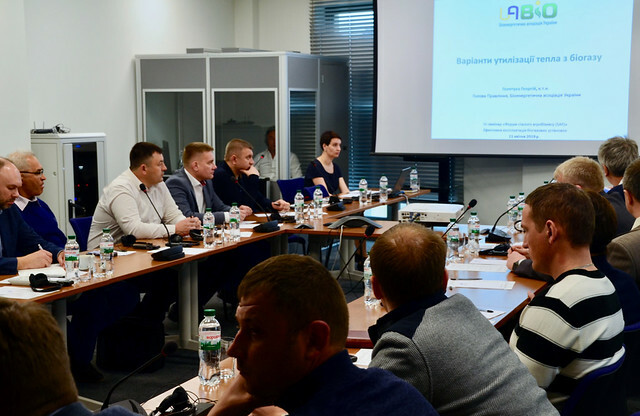 Chairman of the Board of the Bioenergy association of Ukraine Georgii Geletukha reviewed the current state of biogas projects development in agriculture sector of Ukraine and their efficiency. Also, the Chairman of the Board told about ways of energy utilization of biogas, in particular biogas heat, and considered various business models of biogas mini-CHP plants projects, comparing the economic indicators of such projects under the green tariff scheme and the auction. Michael Köttner, Vice-President of the German Biogas and Bioenergy Society GERBIO in German FnBB e.V. and the CEO of the International Biogas and Bioenergy Centre of Competence IBBK, presented a detailed overview of the best available technologies for the main components of the agricultural biogas plant. Ivan Traksler, Director of “MHP Eco Energy”, told about the preconditions for the effective operation of the biogas complex, as well as the peculiarities that should be taken into account, starting from the design and construction stage. Unfortunately, there are currently no specialists in Ukraine in the field of biogas production and cogeneration, so the stage of commissioning and reaching planned capacity is the most difficult stage that requires the involvement of foreign specialists – Ivan Traksler, director of PJSC MHP Eco Energy. Options of heat utilization from biogas – Georgii Geletukha, Head of the Board of Bioenergy Association of Ukraine (UABio). Overview of the Best Available Technologies in biogas production from typical for Ukraine types of feedstock – Michael Köttner, Vice-President of the German Biogas and Bioenergy Society GERBIO in German FnBB e.V. and the CEO of the International Biogas and Bioenergy Centre of Competence IBBK. Practical aspects of biogas facility effective operation – Ivan Traksler, Director of “MHP Eco Energy” (in Ukrainian).